For this area of the house, you want to concentrate on the most used areas and the stains that have been bugging you for, well, forever. For the remaining areas, you can give a quick once over for an overall clean floor. Look over your rooms and determine which areas need the most care. This is likely to be near entryways, where people eat, play spaces, and hallways. Use your vacuum in these problem areas, going back and forth for about 30 seconds in bad spots. For area rugs, do the top of each rug, then lift and fold back the corners where you can to vacuum the underside. Dampen a cloth with your cleaner/degreaser (not for sisal) and apply it to stains. I like LA’s Totally Awesome cleaner and degreaser which works well to fight stains. Let the product sit for five minutes, then blot with a fresh, dry cloth, working from the edges of the stains toward the centers. If there’s still more, blot again with a fresh cloth, this time applying pressure with your foot to get really deep. Use a hair dryer set on high to dry each spot. Open the windows to let it dry. Finish the job by vacuuming the rest of the room being sure to move furniture. For the hard floors in your home, the cleaning tips vary depending on the material of the floor. With the right products, you can quickly clean and polish these surfaces and move on with your cleaning. To protect the floors in your kitchen and bathroom from another year of wear and tear, wax or apply a sealer following label directions. The simplest method would be to use a combination wash-and-wax floor cleaner. No-wax floors don’t need a polishing treatment per se, but an occasional makeover will keep them looking fresher and add a protective buffer that could help them last longer. 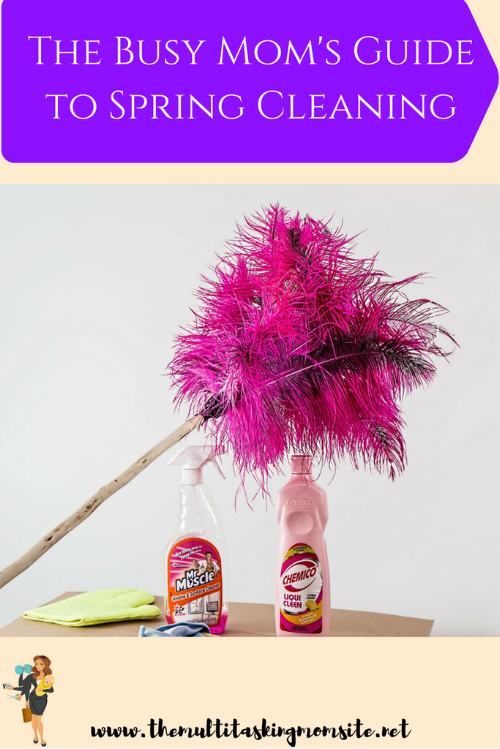 Your best bet is to use a floor cleaner that both cleans and shines. For wood floors, it is important to move furniture and rugs aside and then apply a wood cleaner. This should be followed up with either liquid or paste polish to clean and add a new wax coating. This job not only removes dust and dirt, but now you can let in that spring sunshine! Your rooms are getting cleaner and you can save on electricity! For efficiency, focus your energy on the exterior where the majority of the dirt is. Also, try to choose an overcast wind-free day. This will prevent getting sprayed while you clean as well as streaking on your windows. Close all of your windows and screens. Then stand outside and using your whisk broom, brush away the debris from the screens you can reach as well as from the tracks. There is no need to have the hassle of removing the screens. Attach the Windex Cleaner to your hose and remove the plug. Set the dial on the top to Rinse. Then stand about 5 feet away and spray your windows through the screens. The power of the stream will let you reach windows on the second floor without a ladder. Make sure to move the stream back and forth to shake debris loose. Also be sure to hit cobwebs in the corners and bird droppings on the glass. Lastly, run the stream up and down the window frames. Next turn the dial to Clean. Shoot suds onto screens and frames. Let the soap sit for 30 seconds. Next you turn the dial back to Rinse. Spray everything from the screen to the frame, top to bottom, to remove suds. Push the screens (that you can reach) up to expose the windows and then repeat steps 2 through 4. Finally, head inside and get your bucket of soapy water. Lay down your sheet to catch any drips. Then open the windows. Wet and wring out your cloth in your soapy water, and wipe the screens. Close the windows and with a fresh cloth, do the same thing to the windows using circular strokes starting from the outside corners in. Odor Eliminator and Wrinkle Releaser, like Downy. Safe for most materials. Close your windows and curtains. Spray a curtain panel with your Odor Eliminator and Wrinkle Releaser. With the steamer, using the step stool if necessary, work your way from the bottom to the top. For lightweight fabrics, hold them taut with one hand;. This is not necessary for heavier fabrics. Glide the steamer over the curtains in one-foot sections, placing the nozzle about an inch away from the fabric. You should only need to steam one side unless you have excessively thick curtains. Finally, open the windows to help the curtains dry.